By Ashutosh KS in Desktop. Updated on April 13, 2018 . Editor’s note: This branded content is brought to you by Nuance Communications, Inc. If I ask you to name a utility for working with PDFs, you may quickly answer “Adobe Acrobat”. However, there are many affordable alternatives that work equally well; and Nuance Power PDF is one of the accessible yet usable solutions to create, edit, convert, and do a lot more with PDFs. I am on a hunt for an affordable solution for working with PDFs, and let us see how Nuance Power PDF performs for me. So, in this detailed post, I am going to try out the trial version of Nuance Power PDF Advanced and share my findings. Come on, dive in with me, and do share your feedback through comments. First look? It is straightforward. Let us talk about my first encounter with Nuance Power PDF Advanced. I find it easy and straightforward, thanks to its intuitive interface. When I first opened Nuance Power PDF, I was happy to see a beautiful user interface. 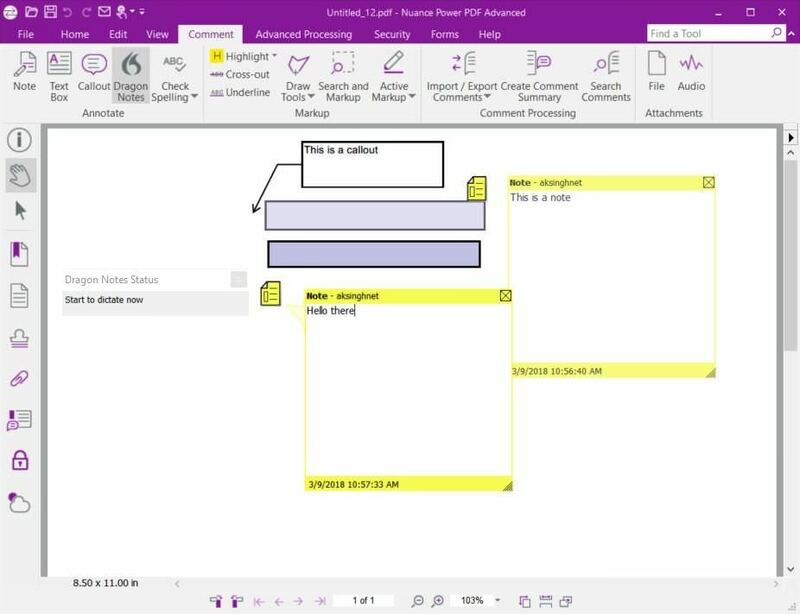 It has the same ribbon interface that we know from File Explorer in Windows 10 or applications of Microsoft Office 2016. That means, you will need little training to get started with this app — all the options and tools are available in a familiar and beautiful interface. Moreover, there is also a search bar to find an option or a tool quickly. Power PDF avails lots of features and options for creating and editing PDFs. You can create a new PDF from the clipboard, a scanner, a file, or nothing (a blank PDF). 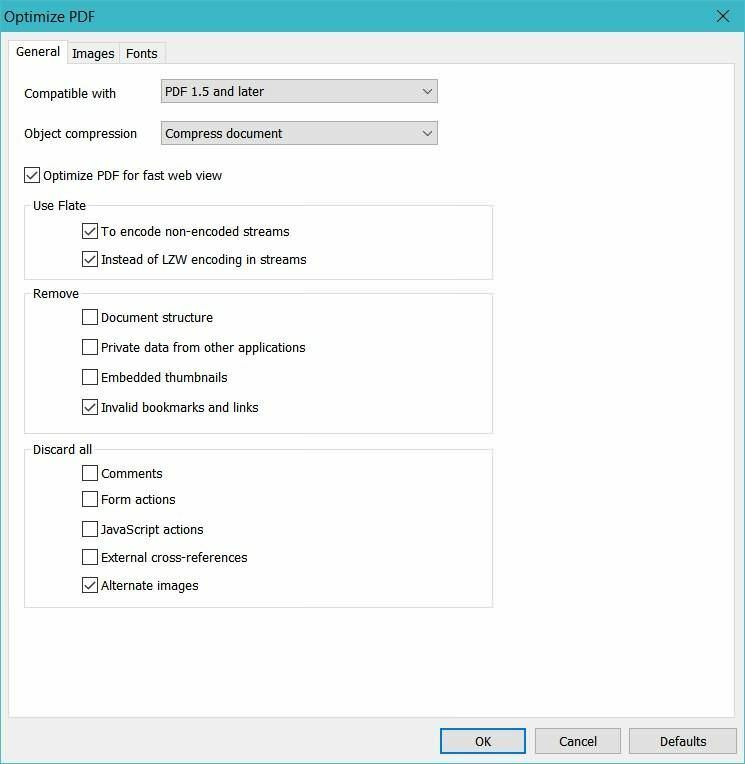 Using its file option, you can create a PDF from one or multiple files and also combine or overlay multiple PDFs into a single PDF file. Using the scanner option, you can use its OCR features to scan sheets of paper (say, of a book) using a camera or a scanner and convert them to a PDF. I found its OCR does pretty good, but you may not see the same result with complex contents say an electricity bill or a handwritten text material. 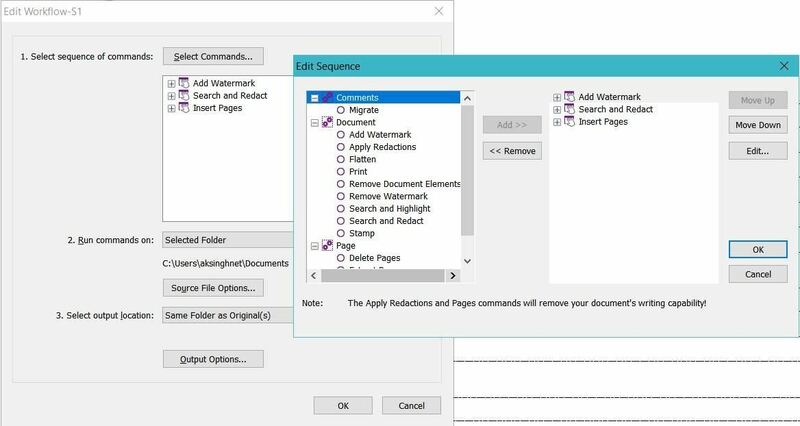 Once you have created a PDF, you can convert it (not required in case of a blank PDF) to an editable PDF and use its advanced editor to edit the PDF like a text document. Its editor has all standard editing features (which you find in Word) including options to insert photos and tables, track changes, etc. 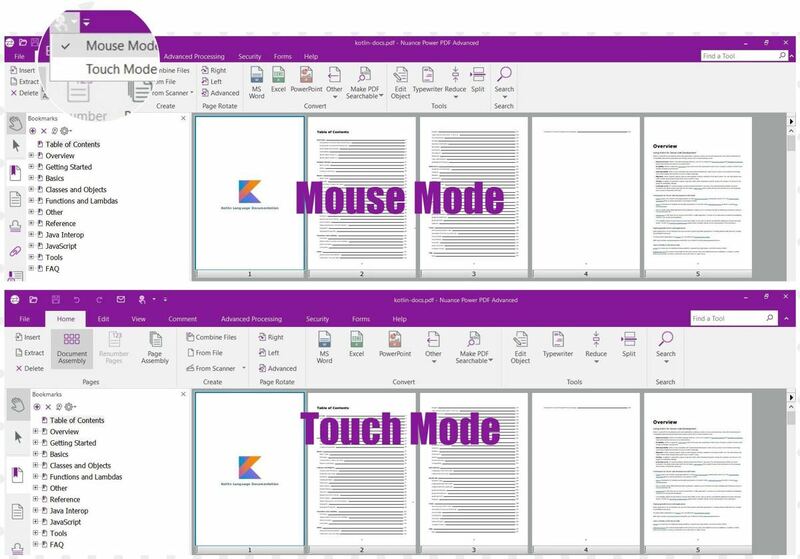 After you exit the advanced editor, you get returned to review mode, which offers many more features to work with the PDF. You can add audio and video, 3D objects, notes, files, and more in this mode. You can also highlight text, create forms, do PDF tasks, manage security, etc. in review mode. I liked its Dragon Notes feature, which lets you speak to create notes but I found the speech recognition was bit shaky and inaccurate — at least for me. Power PDF is a powerful tool for converting, merging, reducing, searching and sharing PDF files. That said, if you are using freeware or a limited PDF solution, then this tool may speed up the way you work with PDFs. 1. Convert from PDFs. Power PDF cannot just convert different files to PDFs but can also convert PDFs to other files, unlike some other tools. Also, it keeps the formatting intact during conversions. For example, if you need to edit a PDF file in Word, then you can convert it to DOCX and edit the same in Word. 2. Create searchable PDFs. You may know that all PDFs are not same and some of them are just a bunch of photos (even if they contain text in them). Such files are non-searchable — at least while using search tools or freeware PDF tools. But Power PDF can make them searchable, thanks to its OCR features. 3. Optimize & reduce PDFs. You can optimize files to make them compatible with standard PDF (like “PDF 1.5”). You can also reduce the size to less than half of the original file size. Moreover, you can also opt to compress objects, remove unnecessary elements, and include more optimization options. Every business needs to protect its data and Power PDF offers numerous options to secure your PDFs. You can certify PDFs, restrict to edit documents, add digital signatures, and manage digital identities to configure access control. 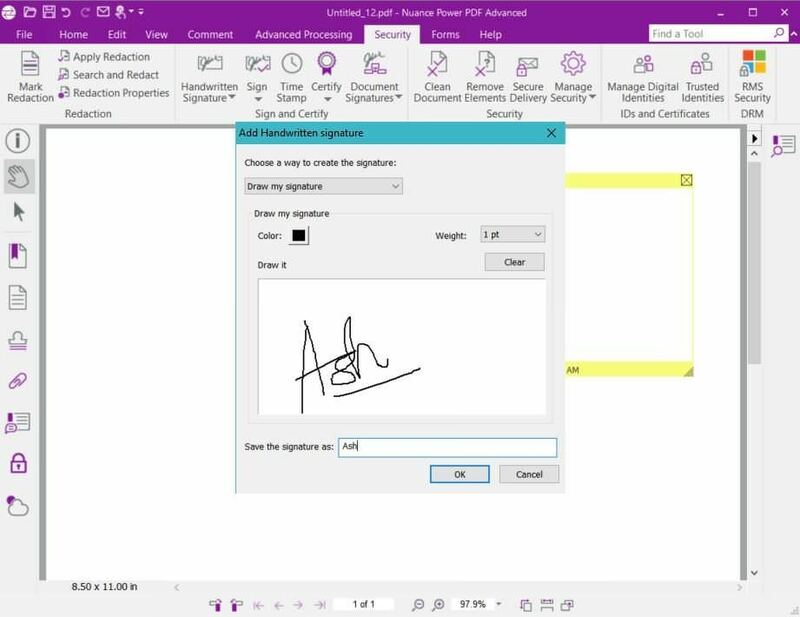 Interestingly, you can also add handwritten signatures to files in case you have an image or a supported device like a mouse or a touchscreen device. Power PDF allows you to create PDFs from almost any app, thanks to Nuance PDF — its virtual printer that lets you print to a PDF file. 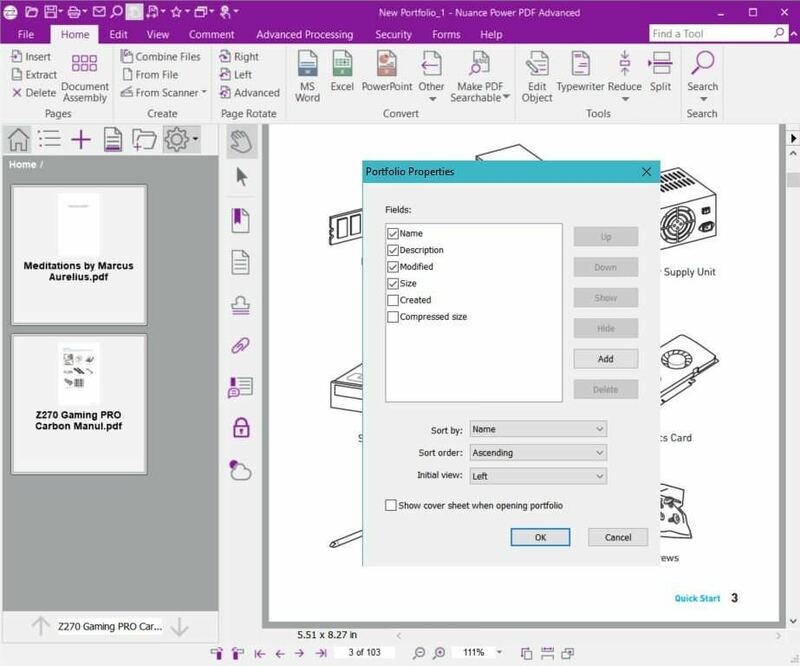 It offers a lot more printing options than “Microsoft Print to PDF”, however, you must use system dialog to access them in few apps. Also, it avails its native extensions for Office applications that support advanced options to work with PDFs. Moreover, it also gets well-integrated with the Windows Context Menu. That means you can work with the supported files right from the desktop or the explorer. For example, by right-clicking an image or text file, it shows an option to convert the selected file into a PDF without even opening Power PDF. Pros: What did catch my eyes? After using it for a while, I found many significant features in Power PDF, which I am listing below with my own experience with them. 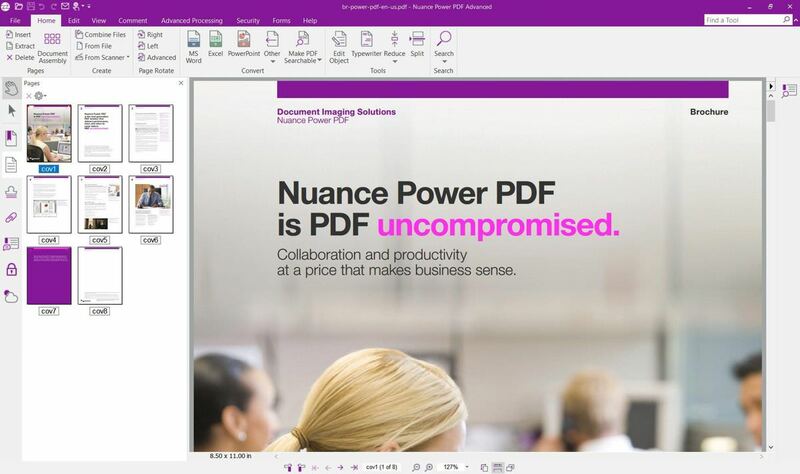 Nuance Power PDF offers native support for touchscreen devices. What I found interesting is you can even enable the touch mode on a regular desktop, and in response, the app adds more space to the items in its interface. That said, you can enable the touch mode to see spacier ribbons and toolbars. Power PDF supports various popular cloud storage services including Evernote, Google Drive, and OneDrive. You can open and save files from and to these cloud services directly from this app. What surprised me is you can also open different files from multiple cloud services simultaneously. PDF Portfolio is a unique feature of Power PDF, which allows you to store related files in a single PDF. You can think it as a manageable archive of multiple files of different file types along with their metadata. What I liked is this container retains the original security settings of files and folders added in it, so you do not need to re-configure these settings for the included items. 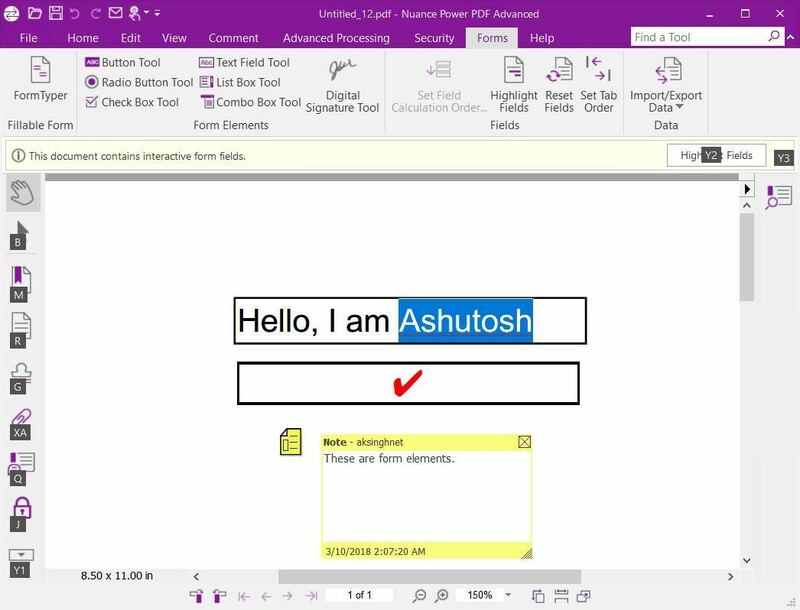 Using its powerful form features, you can create and place forms inside PDFs, which you can email or share with other people. Its FormTyper tool can even convert non-fillable PDFs into fillable forms automatically. That is not all; you can also convert part or all of the form to other document formats. Among your forms, you can include multiple form elements including checkbox, radio, textbox, button, etc. Also, it lets you import and export data from and to supported file types, easing the process of form management. 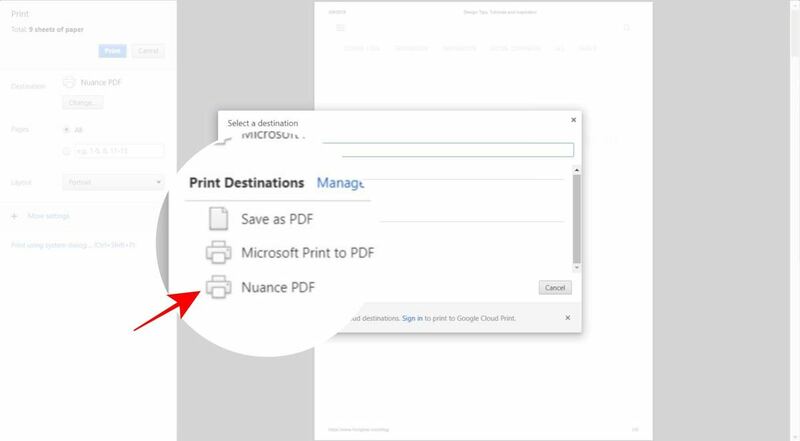 Nuance Power PDF packs in multiple options and tools to promote batch processing, which is just helpful when you need to process lots of PDFs. Its batch converter lets you convert PDFs, and its sequencer allows running a set of commands on one or multiple PDF files. For example, using the sequencer, you can add watermark, search and redact, insert or delete pages, and do more. Cons: What can still be improved? In spite of all its goodness, Power PDF does have a room for improvement and below are my findings as well as few suggestions for its future versions. While installing the trial version of Power PDF Advanced, I noticed its package comes as a self-extracting zip, which extracts the installation files and launches its installer automatically. While installing the app, its installer failed with a message telling failure while installing “VC Runtime 2015”. However, I was able to browse the installation files and install the 64-bit version myself without installing the failed runtime. I am not sure if it was required or if it failed for some issue on my system, but I expect the installer to provide error details and some possible solution as well. Also, if possible, it shall nevertheless install the app with a warning message about the failed runtime. Moreover, its installer’s interface can be improved to make the whole installation experience a breeze for its users. I think people will love a refined installer with better look & feel, a clean installation window with advanced options hidden behind a button, and an interactive and intelligent installer engine. At the time of writing, I found Nuance Power PDF Advanced opens every file in a new instance or window. Though it is not an issue until I open multiple files at once yet a tabbed interface will make me love it even more. 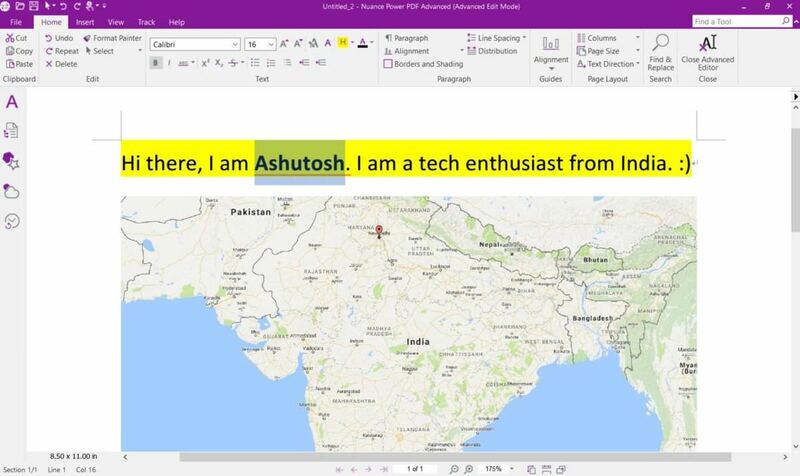 However, it is my personal preference, and also, it is worth noting that Microsoft Office 2016 apps like Word and Excel do not have a tabbed interface as well. Though Power PDF has a beautiful interface (even if compared to Adobe Acrobat Pro DC) yet I find there is a room for improvement here and there. Although these are not important enough to break your work process, I think you will appreciate these minor improvements in its interface. For example, while using Dragon Notes, I found it has no start or stop buttons; it merely starts recording when you click on it and stops recording when you press the close button. With start and stop buttons (and a pause, if you ask me), I can dictate at my will and even take a break in between if needed. I could not help but notice that I was not able to use keyboard shortcuts in its advanced editor. For example, in its advanced editor, I tried using Ctrl + B to make some text bold, and to my surprise, it did not work until I clicked the bold button from the ribbon toolbar. I found few shortcuts work in review mode (like shortcuts to find, show ruler, etc.) but none works in the advanced editor. Though Power PDF packs lots of options to create PDFs yet I miss a feature to generate a PDF from a web page, which is available in Adobe Acrobat Pro DC. I find this feature helps create offline versions of websites, which prove helpful in many cases, say if you are travelling with no or a shaky web connection. But I found it has a corresponding browser plugin that does almost the same task. How is Advanced over Standard? Nuance Power PDF Advanced, which is specially built for businesses, is the more powerful version of Power PDF Standard. It packs in all the goodies from the standard version and offers some more to meet business needs. 1. Support for document management systems. Power PDF Advanced supports many well-known enterprise document management systems like SharePoint, OpenText eDOCS, HP WorkSite, Livelink, Worldox, and many more. 2. Redact feature. 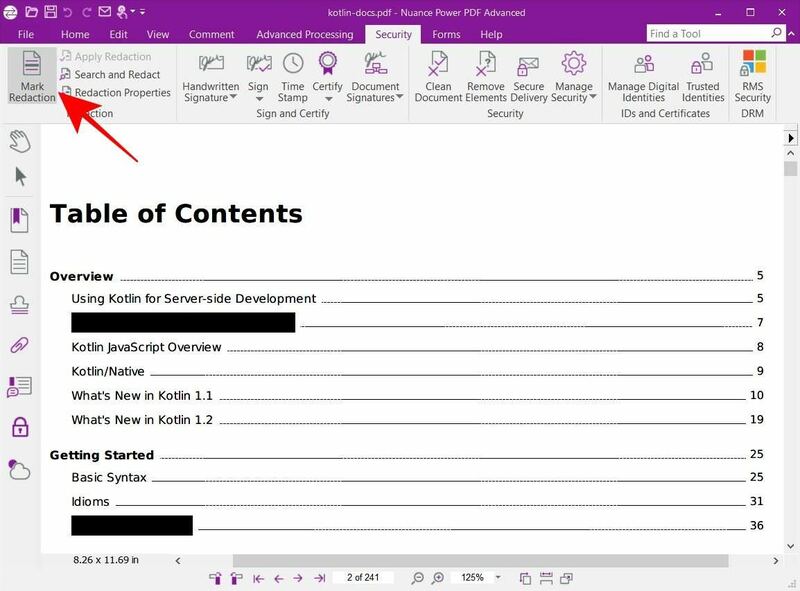 You can redact sensitive information from documents using the advanced version of Power PDF. It allows you to black out or white out, i.e., hide/delete some information while showing rest of it in any PDF. 3. Bates stamping. Power PDF Advanced supports labeling or numbering the PDFs using Bates stamping. It helps your business to mark and identify the PDFs with identification or copyright info like company name, logo, etc. 4. Watched folder. 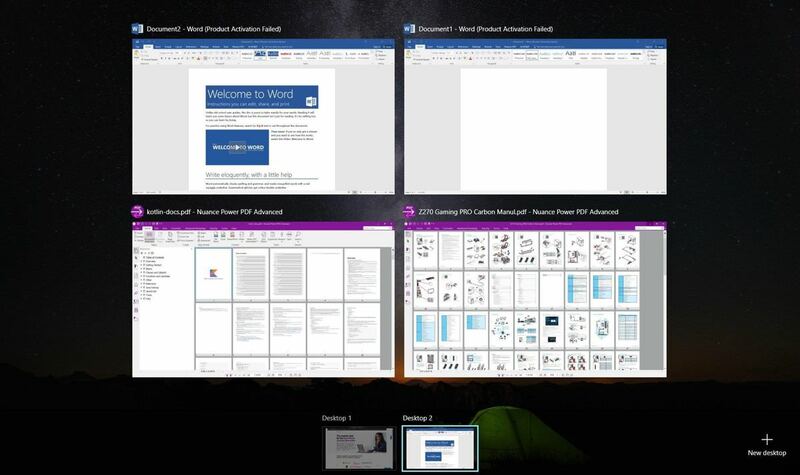 You can use a watched folder to create PDFs automatically with the advanced version of Power PDF. 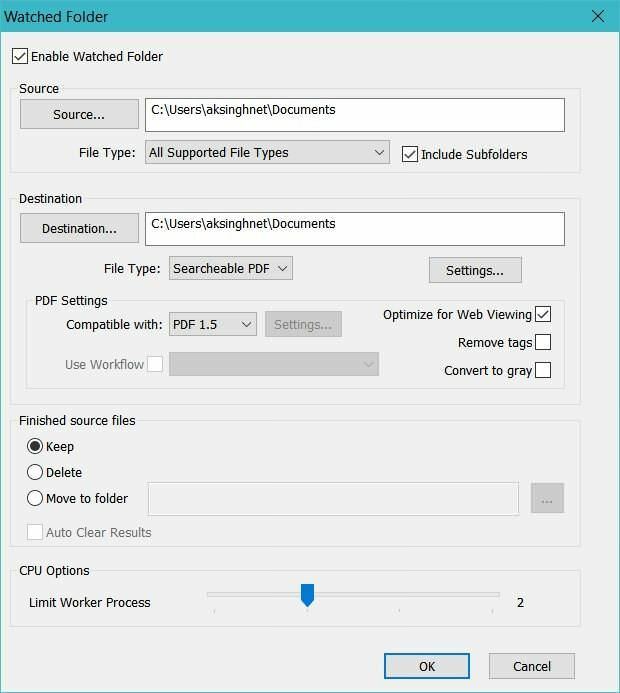 It allows you to place any file in the watched folder and it will auto-create a PDF for the file per settings. Shall I opt for Nuance Power PDF? Nuance Power PDF Advanced packs in many features for an affordable cost. Moreover, it comes for a one-time fee, which proves way more cheaper than a subscription. And if you are a home or a casual user, you can opt for its standard version to save even more for almost the same set of features. That said, Adobe Acrobat Pro DC requires you to opt for a subscription (it is no longer available for a one-time fee) at 24.99 USD/month or 179.88 USD/year. However, Nuance Power PDF Advanced costs you a one-time fee of USD 149.99 and its standard version with fewer business features will cost just USD 99.99. Last but not the least, let me remind you that Nuance Power PDF offers a 30-day trial for Advanced Version and 14 days for its Standard version. So you can see for yourself by opting for its trial version and trying out its powerful features.